On March 15, 1937, H.P. Lovecraft died. Today he is considered the father of modern horror literature, although at the time, his stories were not widely popular. I have a great deal of passion for Lovecraft and his writing of cosmic horror, nihilism and an uncaring universe. Unlike some, I love his prose and archaic style. I believe it lends itself to a more moody and deliberate atmosphere of horror. I first came into contact with his stories right after buying Call of Cthulhu, the roleplaying game in 1992. I didn't know who he was, but his stories' titles listed in the rulebook piqued my curiosity. I quickly devoured his first stories. Up until then, I had played mainly fantasy games. After that, I began focusing on horror and telling stories, with the investigative elements and mood coming to the fore. Not that fantasy games are devoid of these things, but the way we played them, it just wasn't our priority. So, in a way, Lovecraft was responsible for my distancing from fantasy games. 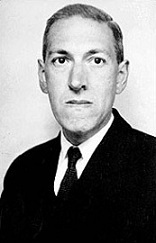 As it pertains to this blog and AD&D, Lovecraft was recognized by Gygax as a major influence on the game. The Mythos pantheon was detailed in the Deities and Demigods sourcebook, leading to a serious contention between TSR and Chaosium. The mindflayers bear a striking resemblance to Cthulhu. Lovecraft's circle of friends, with whom he corresponded frequently, included Robert E. Howard, whose Conan's stories are sprinkled with Mythos elements, Fritz Leiber and Clask Ashton Smith, whose works also heavily influenced the game as I told in an earlier post. For this, and for having brought horror and madness to the world of literature and my own world, and because my favourite roleplaying game, Call of Cthulhu, owes its existence to him, I will always have a fondness for Lovecraft and his stories of gothic and cosmic horror.